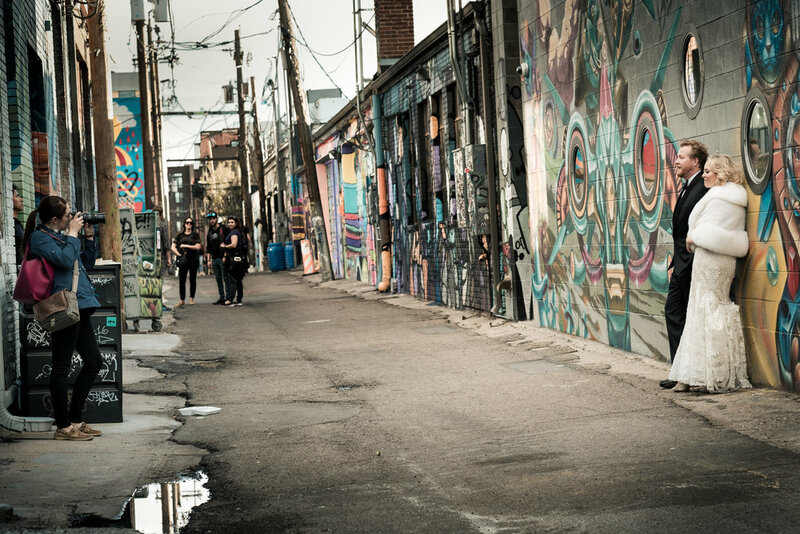 Will's photo of me shooting Justin & Suraya in Denver's iconic RiNo neighborhood. I love the curious onlookers. 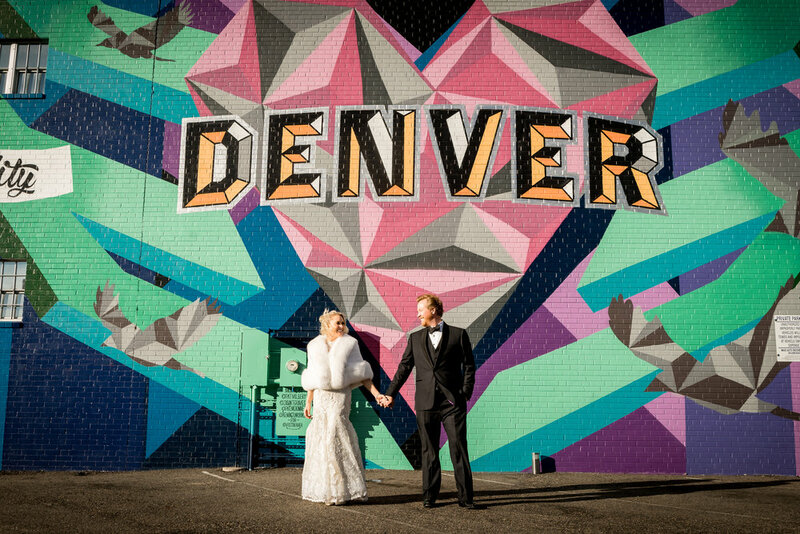 OKAY Okay, so technically it wasn't the day after their wedding—but I was so glad these two were willing to don their formal wear and explore Denver with Will and I. One of the beautiful things about being a wedding photographer is that I get to see how special complete strangers feel when they're around a bride and groom. For me, it's like being a celebrity's handler for a few hours. Onlookers quiet down, watch our every move, kindly move out of our shots without being asked, and sometimes even try to sneak their own cell phone photos to remember those few moments they were in the presence of wedding royalty. Our temporary celebrity this day was especially fun because it didn't come with any of the weighty significance or compulsory floor show synonymous with an actual wedding. We absorbed the friendly shouts of "Congratulations!" in the street sans the mental load of distant relatives waiting patiently for their 3 minutes of chitchat while sipping signature cocktails, limo drivers waiting to be tipped, or choreographed dances to remember. 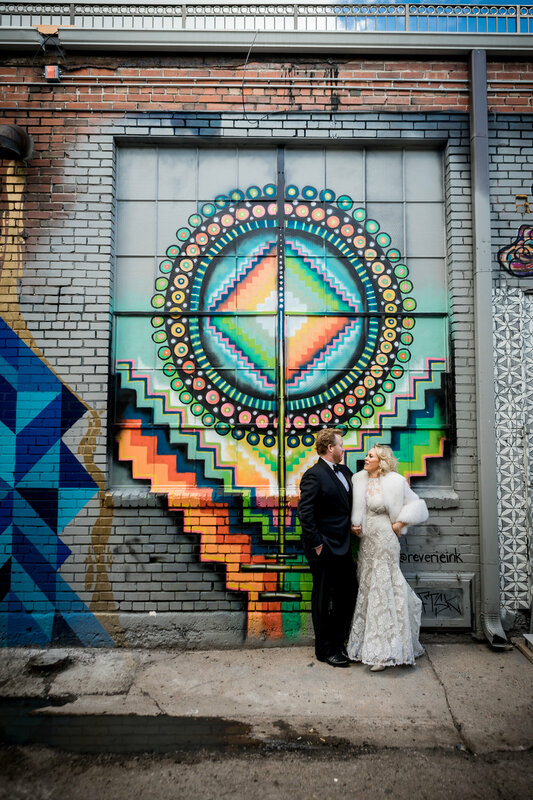 We had all the time we wanted to find the best street art and laugh together. And isn't laughing together is what it's all about anyway?